Generally, most people are aware that adequate hydration or irrigation, which is the process of supplying water to crops or land through the use of specific channels, is vital to the health of your lawn. But many of us, including gardeners and landscapers, might not necessarily know or have an in-depth understanding of the intricacies that are comprised of proper lawn watering and irrigation. Our goal is to deepen your knowledge of this subject. In this article, we will supply you with a wealth of beneficial information and tips that will help to maximize your understanding of what proper lawn watering entails as well as increase the health of your lawn. Let us begin by discussing when to water your lawn and the best times to do so. When Should a Lawn Be Watered and What are the Best Times to Do It? 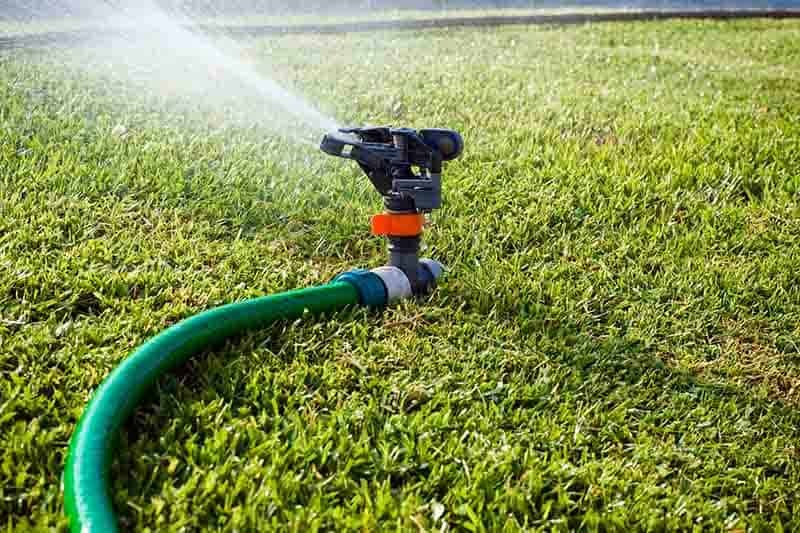 The morning is the most appropriate time to water your lawn since the air is cool during this time of the day and the water is more likely to penetrate deeply and hydrate the grass. More specifically, the best times are anywhere between 4 am, and 10 am. The middle of the day is not optimal because of the warmer temperatures. During this time, the water on the grass is very likely to evaporate quickly; thus minimizing penetration into your lawn. The evening is also not an optimal time to water the lawn because it increases the chances of fungal growth on the grass. The water does not effectively penetrate into the grass during this time of the day; instead, it is more likely to grip to the blades of the grass throughout the night. In turn, this can cause lawn diseases. If you cannot water the lawn between 4 am and 10 am during the week, it is better to wait and do so on weekend mornings as opposed to doing it in the evenings after work. The best case scenario is if you have sprinklers that can be set on a timer. The convenience of timed sprinklers will alleviate the burden of having to get up early to water the lawn. How Often Should the Lawn be Watered and How Much Water is Considered Sufficient? The answer here is two-fold. The frequency of which you should water your lawn is less important than the amount of water that the lawn needs to remain healthy as well as flourish. Across the board, a lawn typically needs at least one inch to one and a half inches of water per week, all year around. Due to evaporation, you will need to water the lawn more frequently during summer months or if you reside in an area that mostly consists of hot temperatures. This is because the heat has a tendency to dry out grass, thus insufficient hydration will thwart its health. As a rule of thumb, it is better to water your lawn deeply 2-3 times per week than it is to do so inadequately on a daily basis. Also be mindful that the same way in which insufficient watering can thwart the health of your lawn, overwatering can also cause more harm than good. Too much water penetration can lead to a shallow root system and cause funguses. Keep in mind that different types of soil require different amounts of water; therefore it is important for you to know specifically what type of soil your lawn consists of. The soil is very rarely comprised of just one type. Instead, it is usually a combination of sand and clay, also known as loam. This loam does not retain water very well, but clay, itself, tends to retain moisture much better. The key issue is that the water penetration of clay is somewhat slow. You can fairly easily tell what your dominant soil type is since clay will normally crumble into a ball that does not fall apart when it is in your hands, whereas sand tends to stick together for a short period of time when it is squeezed. A trick that will help to determine whether or not your lawn is properly hydrated is through the use of a screwdriver. If you have difficulty or cannot drive a 6-inch screwdriver into your lawn, then more than likely, it needs more watering. The reasoning behind this is that when you water your grass, the water should moisten the soil approximately 6 inches deep. Here is what we recommend. Set aside a specific day when time constraints will not interfere. While watering the lawn on that particular day, check the soil after approximately 15 minutes by using a screwdriver or shovel to see how far the water has penetrated into the ground. From there, track the time that it takes for the water to penetrate 6 inches deep. This will let you know the duration of time that your lawn will need to be watered on a regular basis in order to receive proper penetration. It will also keep you from over watering the lawn. Note: If you are using timed sprinklers, be sure to reset and adjust the timing accordingly. In this system of irrigation, which is also known as overhead irrigation, water is distributed throughout the air similar to the way that rain comes down. Sprinkling devices can be set momentarily and then moved intermittently based on time and the amount of watering desired. They can also be set in place permanently by a construction that is built into the ground. Lastly, they can be built on pipelines that continuously travel across a surface of the land. This type of system is a technique of micro-irrigation in which water is supplied through emitters as droplets or little streams to the soil surface. The water distribution rate of these emitters is low enough to be used on almost all soil types. Micro-irrigation techniques apply less pressure and flow than traditional sprinkler systems. This type of irrigation, which is mainly used on large plots of land, consists of a wide range of irrigation techniques in which water is dispensed over the surface of the soil by means of gravity flow. 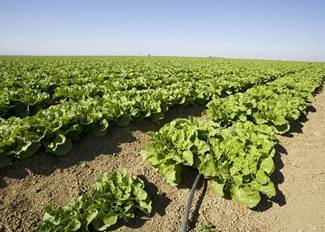 In short, the watering process takes place by a sort of controlled flooding on the land. This type of irrigation is best suited for vast acres of land where the grass spans across in chunks. Some of the surface irrigation types are border irrigation, which is most fitting for drilled or flat planted crops that lie on precision graded fields and slope in one direction, and furrow irrigation. Furrow irrigation is a technique in which trenches are hollowed out between the crop rows of a field so that farmers have the ability to flow water through these trenches. Here is a visual image of what surface irrigation actually looks like. In these systems, water is applied beneath the surface of the soil. The specific technique that should be used is normally dependent on how deep the water table is. Here is a visual image of what sub-surface irrigation looks like. Regardless of whether you decide to manually water your grass by using a hosepipe or by using sprinklers, here are some key things to know. - In general, lawn sprinklers that are built into the ground are the best systems to use for lawn watering primarily because they are efficient. In terms of cost-benefit, these irrigation systems are worth the investment if you are planning to live at your current residence for a long period of time. 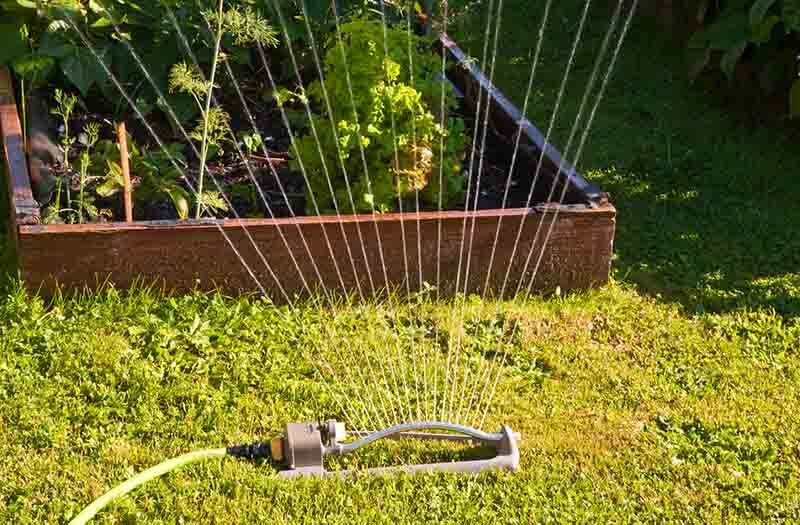 - If you do not want to invest in an underground irrigation system, the next best option is a pulsating, revolving sprinkler that is connected to a garden hose. This type of sprinkler discharges the water horizontally at high speed; therefore it is not as susceptible to evaporation and wind in the way that an oscillating sprinkler, which discharges water vertically, is. Pulsating, revolving sprinklers can be considered ideal for an established lawn. Below is an example of what a pulsating, revolving sprinkler looks like. - Although pulsating sprinklers are an optimal choice for lawns that are comprised of mature grass, they can cause more harm than good to a new lawn. The powerful water flow of pulsating sprinklers can wash away the seeds of new lawns. Alternatively, oscillating sprinklers allow the water that is discharged to land more softly onto the lawn; thus causing minimal to no harsh impact on the seeds. Because of this, oscillating sprinklers are better for new lawns than pulsating ones. Here is an example of what an oscillating sprinkler looks like. Lawns that are a part of new housing developments in which the topsoil was removed tend to consist of such tough soil that it is difficult for water to penetrate. In these instances, we suggest watering your lawn in approximately 30-minute phases with intervals in between in order to soften the ground so that the water has the ability to break through the soil. How long should each zone be watered? The more exact answer to this is dependent upon the type of soil that your lawn is comprised of as well as the climate that you reside in, but in general, we suggest that you water each zone for approximately 15 minutes. This usually allows enough time for the water to penetrate 6 inches into the ground. If you are using a sprinkler system, simply set it to stay in one zone with the use of the timer and then set it to move to the next zone once the 15 minutes have passed and so on and so forth. Approximately how long does it take a sprinkler to water 1 inch? It normally takes roughly 30 minutes, but we recommend that you test this by running your sprinkler and timing it in order to arrive at an estimate that is specific to your lawn in particular. We advise that you perform this test in order to account for soil type and climate considerations. How often should a newly seeded lawn be watered? Just about 10 minutes in the morning as well as 10 minutes in the evening on a daily basis. This should provide your lawn with adequate water to keep the top layer of soil moist. You can begin to water the lawn deeper and less often once the grass begins to grow and bloom. This will push the established roots to penetrate deeply into the soil. Can you still water your lawn during a drought? We recommend that you hold off on your normal watering schedule during any period of drought and follow any instructions provided by local authorities. 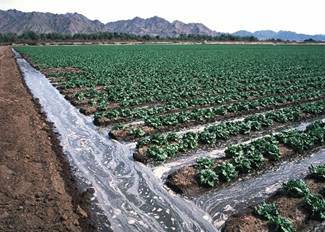 What is the basin irrigation method? This is an ancient irrigation method in which short-term flooding was used on land that could withstand mass quantities of water. At the time it was the best way to cultivate crops. Now that we have discussed the basics as well as some of the intricacies of proper lawn watering and irrigation, it is fairly safe to conclude that you now have a good understanding of the best practices and steps to take in order to maximize the health of your lawn. 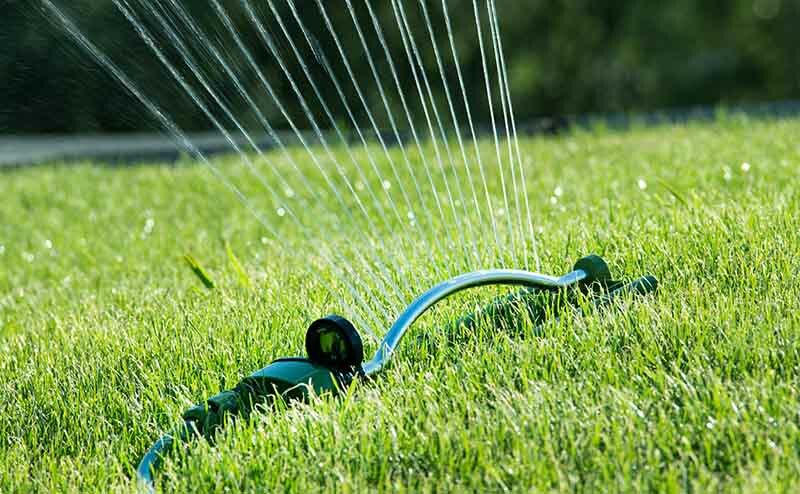 Knowing when, how, and the best times to water your lawn are key aspects of lawn care that all gardeners, homeowners, and landscapers should know. Let us know what you think of this article and feel free to share it with others if you liked it and found it useful.